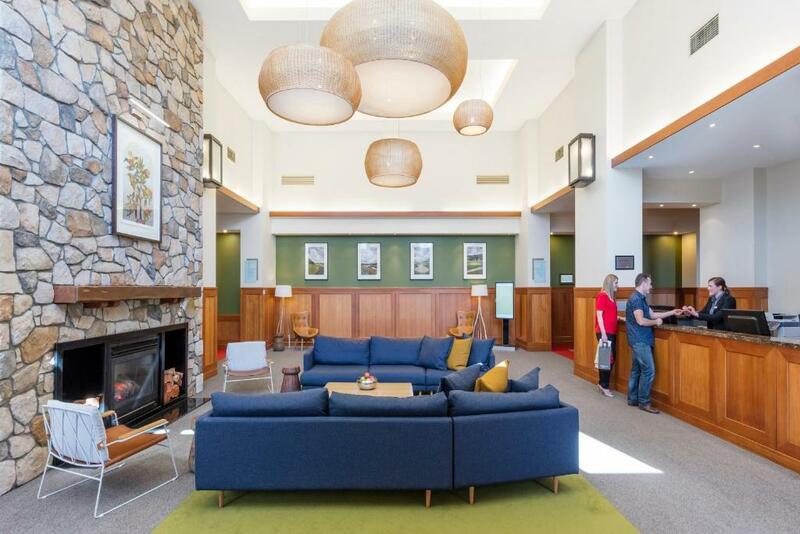 Lock in a great price for Yarra Valley Lodge – rated 8.9 by recent guests! ALL OF THE STAFF WENT ABOVE AND BEYOND TO BE HELPFUL. SERVICE WAS DEFINITELY A KEY PART OF THEIR TRAINING. FROM STORING OUR LUGGAGE WHEN WE ARRIVED VERY EARLY TO FINDING US A PLACE TO GET A FLAT TIRE FIXED ON EASTER WEEKEND TO GREAT SERVICE IN THE RESTAURANT. WE WOULD HIGHLY RECOMMEND. The breakfast was delicious. All of the waitstaff in the restaurant were simply the loveliest, and the food was stellar (to say the least!). The view from the room was more of the carpark than the mountain, but everything was clean, comfortable and relaxing. This hotel is SO clean!!! 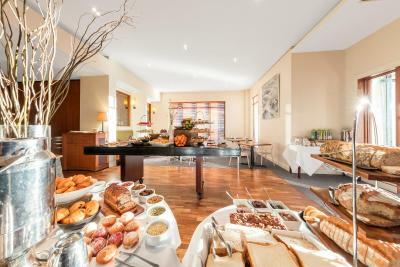 And the breakfast is amazing : )) Staff are really friendly and always smile if they walk past. Not the first time we have stayed at the Yarra Valley Lodge. Super comfortable bed, great sized room, wonderful pool/leisure facilities and the best breakfast! kindly staff, very comfortable bed, awesome breakfast. Everything about this accommodation was perfect!!!! Fantastic size bath for our boys (2, 5 yrs) very comfy beds. Great breakfast & the view was Devine!!! We expected very good accommodation but it was way better than our expectations. 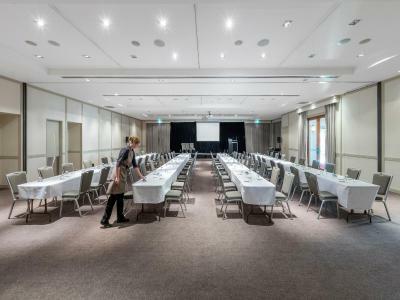 From the first contact with the friendly, efficient and helpful receptionist to the cleaning staff, wonderful restaurant workers and our final contact with another excellent receptionist is was a real pleasure. 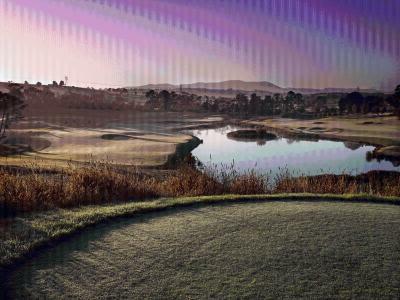 The room was immaculate, the food fantastic, the outlook with rolling golf links populated by iconic kangaroos just added to the experience. I rarely give reviews but I suppose the best comment I can make is that if (when!) 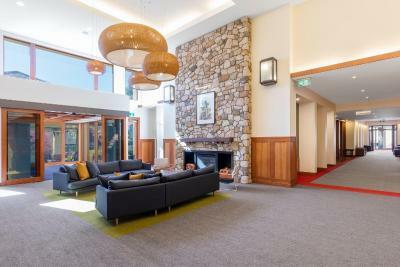 we head back to the beautiful Yarra Valley the Yarra Valley Lodge will be our first choice for accommodation. The quietness - it was so peaceful. The staff were friendly and the breakfast chef on the weekend, Craig (?) was both an excellent cook and very friendly. The landscape was beautiful and peaceful. Bed comfortable. 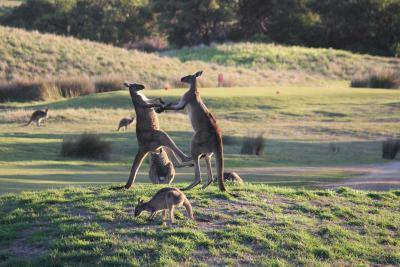 Kangaroos to watch. 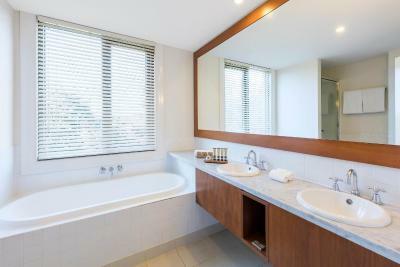 Bathroom clean and well maintained. Water hot and powerful. TV had a usb input for our hard drive of movies! 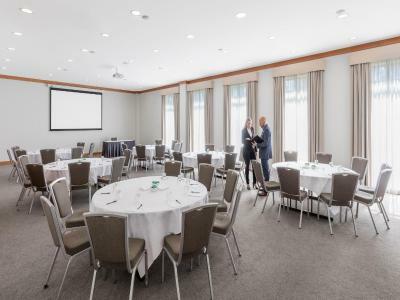 Yarra Valley Lodge This rating is a reflection of how the property compares to the industry standard when it comes to price, facilities and services available. It's based on a self-evaluation by the property. Use this rating to help choose your stay! 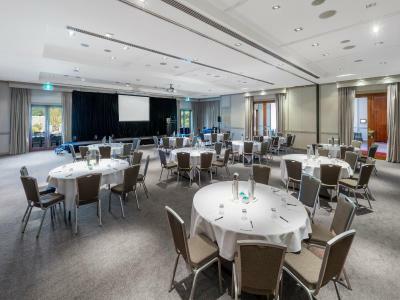 The Yarra Valley Lodge is located in the heart of wine country, only 45 minutes’ drive from Melbourne. It features 2 golf courses. 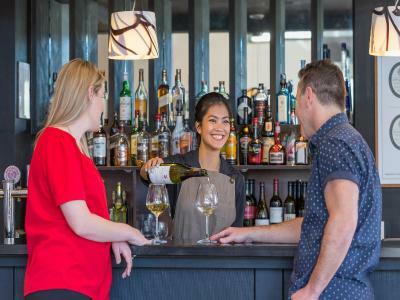 Guest can dine at the onsite Bella Restaurant and enjoy a drink at The Lodge Bar. 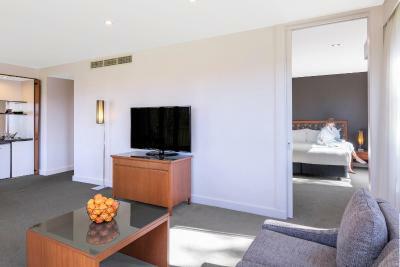 All rooms at Yarra Valley Lodge include an private bathroom, a flat-screen TV and heating/air conditioning. Guests enjoy their own balcony or patio. Room service is also available. The Yarra Valley Lodge is ideally placed for you to explore both the Yarra Valley and Dandenong Ranges. There are over 80 wineries on the hotel’s doorstep. 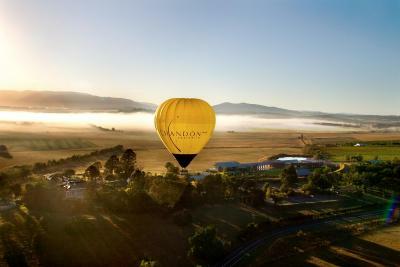 When would you like to stay at Yarra Valley Lodge? This large room features two pillow topped queen beds, a sofa, 42-inch TV, large private bathroom featuring marble vanity and separate shower and bath as well as Appelles bathroom amenities. 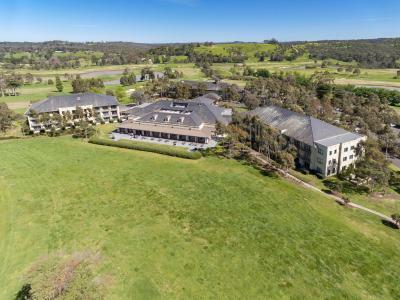 Views open to Heritage Estate grounds and gardens. This large room features a pillow topped bed, a sofa, 42-inch TV, large private bathroom featuring marble vanity and separate shower and bath as well as Appelles bathroom amenities. It opens out to a balcony or terrace and it offers views out to the Heritage Estate grounds and gardens. This spacious room is located in the hotel wing directly overlooking the Jack Nicklaus-designed St John golf course. 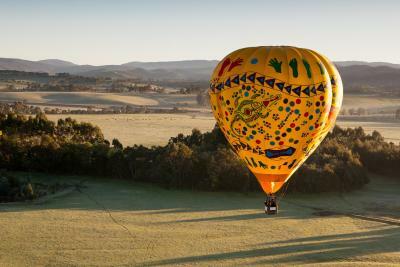 It also features views out to the ranges beyond where you may see lazing kangaroos and sunsets in the evening. 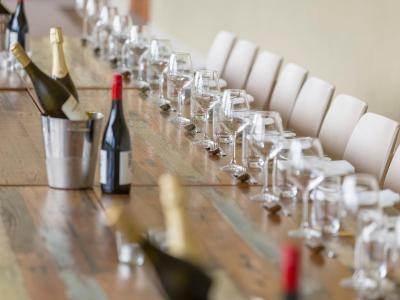 House Rules Yarra Valley Lodge takes special requests – add in the next step! Yarra Valley Lodge accepts these cards and reserves the right to temporarily hold an amount prior to arrival. Please note that an extra guest can only be accommodated in the double rooms. ROOMS WERE DARK. NEED MORE LIGHT. SHOWERS WERE NOT GREAT. There was no tooth brush or tooth paste in the bath room. I was called to book restaurant because they will be booked out which I did, I booked for 6 people and it was my daughter's birthday also, bought my own cake. The dinner was shocking, the meat dishes were disgusting, they were $40-$46 per dish which we though it will be amazing, however, the meat was not edible, we sent back one dish we were confronted by the waitress saying chef said "look the middle is raw" and my husband was very upset and said no get me another one, equally the second piece of meat was very dry. Finally three serves of meat dishes were left uneaten. My dish was fish, again, it was terrible, not a quality food at all. We were asked what can they do, if they can offer us a drink or something, we said don't worry, in the meantime we ordered three serves of tea which we got charged and at the end we were offered 10% discount for the food we did not eat. Very Very disappointed. Reception staff not friendly and did not welcome at all. No complimentary water bottle available in the room. On check out there had been a wedding reception the previous evening and the check out time of 11am had the Reception extremely busy with a queue of guests leaving. I needed to leave to get to the airport so I had to pass everyone and place my keycards on the desk and walk out. As an express check out, a box to leave the keys would be preferable. Pool heat pump broken water too cold to use. Tap in female changing room broken. On departure found charged whole bill twice on credit card, once detected it was rectified within 24hrs. Comfortable Bed, good breakfast. Great first impression on arrival. Breakfast service (Sunday morning) wasn’t great, unless your on a crash diet. Buffet items just didn’t get replenished, super slow, one item (of 6) came out like every 15 minutes... people were waiting in groups on the hope of getting anything at one point. Strangest thing is the faucets in the bathroom of our room were so small you literally couldn’t get your hands underneath them. and the water ran straight out and down into the anti flood hole in the sink!?? Bizarre. Rm219. Also Bathroom and joinery looking a little tired. Oh and you can watch a movie on the 1990’s in-hotel tv service for the bargain price of $15.99... haha. Bed was comfy, room was nice size, easy parking, great area / location, staff were friendly, plenty of coffee options at breakfast. At check in there was only one staff member at the desk and a long line, she asked for help several times but no one came. The lady at the desk was fabulous, very polite and kept calm at a busy time. We love staying here when we come to Melbourne! 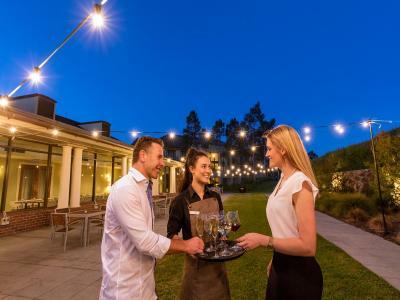 It's away from the hustle and bustle, the grounds are beautiful, the kangaroos are tame, the aroma diffused through the air conditioning system smells divine - you automatically have a feeling of relaxation and the staff are exceptional. 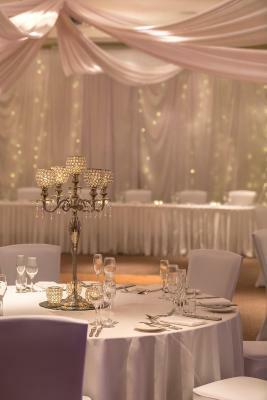 The room is comfortable, spacious and always meets our expectations. This is not a critisism just our preference. When we started coming here, the breakfast was self catering for continental and then you ordered off the menu for a cooked to order breakfast. This has now changed to fully self catering where the hot food sits in the warmers. It must have been a busy weekend for the staff because we did have to wait a while for eggs, has browns etc but overall the food was still nice. I wish to sincerely thank the front desk staff for going beyond what they had to do in helping me solve an issue with the Retreat Day Spa located on the same grounds. Although the hotel is not affiliated with the Day Spa their help was greatly appreciated. There was no guest information available in the rooms. None. When I asked at reception one response was (innocently enough) "I don't know, I haven't been in the rooms!" while the senior responded "It's all online." So aside from the emergency evacuation diagram on the back of the door, plan ahead or make sure you're ready to get your google on.